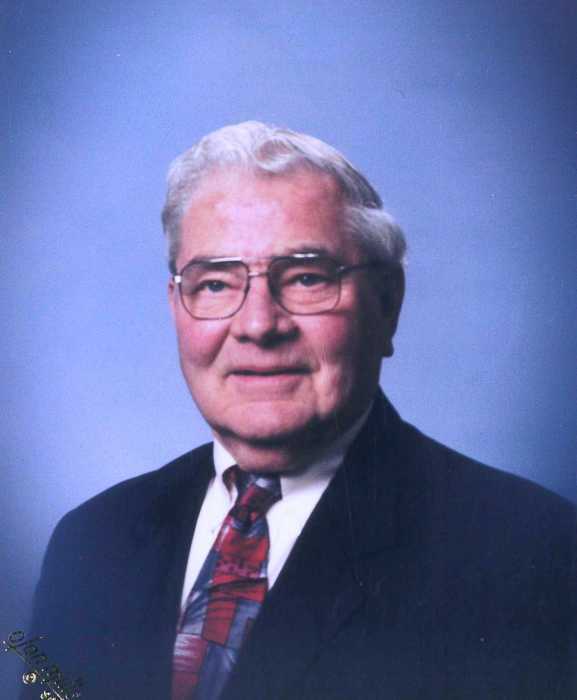 Eugene E. Jones, age 90, of Benkelman, NE passed away on Thursday, February 7, 2019 at the Dundy County Hospital in Benkelman. Gene was born March 24, 1928 in Stratton, NE to Ralph E. and G. Flora (Walker) Jones. He was the second of three children with an older brother Jerome and younger sister Reighe. He attended Stratton Public Schools, graduating with the Class of 1946. In 1939, at the age of ten, Gene joined the Methodist – Episcopal Church in Stratton. He remained faithful to the United Methodist Church throughout his life, nearing 80 years of membership. During his high school years, he was active in sports, band and vocal music. Apparently, his charisma served him well. Aside from activities during school, he was engaged in numerous jobs including being a farm hand, construction laborer, railroad gandy and lumber yard employee. Gene achieved the rank of Life Scout, Boy Scouts of America. Following high school, Gene attended Nebraska Wesleyan University. After one year, he followed his heart to the farm where he was convinced he would find great riches. On September 18, 1949, Gene married Paula Rae Hardy in Stratton. To this union were born Michael, Valerie and Cassandra. To supplement the farm income, which did not achieve the great riches he envisioned, Gene was a meat department manager for Matt Maul at Farmer’s Grocery Store, laborer at Lionberger Lumber Yard, and attendant at Frontier Station, among others. On December 26, 1949, Gene joined Robert Burns Lodge #173. A.F. and A.M. in Stratton, following in the footsteps of his father Ralph and grandfather Bruff. At age 34, Gene sold his farming equipment, packed up his wife, three children and their worldly possession and moved to Dallas, TX to attend mortuary school. Having completed his studies in 1963, he began a series of apprenticeships in Oklahoma, Colorado and Nebraska. After receiving his Nebraska license, Gene managed a funeral home in Trenton, NE in partnership with his dad. In 1971, he and Paula purchased the funeral home in Benkelman from Jay Janousek. Gene operated the funeral home and monument business until January 1, 1999. Gene served as an EMT for over 30 years. Following his divorce from Paula, he remarried. On June 17, 1978 Gene wed Linda R. Harford Neville at the Haigler Methodist Church in Haigler, NE. With this marriage a new blended family was created with the addition of Robert Neville and Deborah Neville. From this point on, Gene was a father of five. Gene’s involvement in civic and charitable organizations is a lengthy list which includes the Hester Home, Senior Citizen’s Center, Historical Society, Cultural Arts, numerous church boards and committees, Stratton Ola Chapter #317 on November 21, 1967, Holly Chapter #233 Order of Eastern Star on April 12, 1973, Shrine, Masonic Lodge, and Spring Creek Band, to name a few. With Linda, he enjoyed 20 years as Santa Claus, many motorcycle miles, compilations of a Nebraska county seat photo album, attendance at high school sports, toy auctions, wood working projects, collector cars and warm friendships. His life’s journey was completed on Thursday, February 7, 2019 in room 108 of the Dundy County Hospital, at age 90 years, 10 months and 14 days. Gene was preceded in death by his parents, Ralph and Flora Jones; first wife, Paula Hardy; brother, Jerome Jones; and nephews Bill Nagel and Jerry Jones. Gene is survived by his wife, Linda Jones of the home in Benkelman; sister Reighe (Burt) Nagel; sisters in law, Judy Jones, Glenda Brown, Jeanette Poore and Vera Hanson; brothers in law, Ted (Vicky) Harford and Tom (Virginia) Harford; son Michael (Joanie) Jones; daughters, Valerie (Richard) Fries and Cassandra Jones; son Robert (Delinda) Neville; daughter Deborah (Carson) Cobb; twelve grandchildren; sixteen great grandchildren (plus one soon to arrive); numerous nieces and nephews and many friends. Memorial Contributions are suggested to The United Methodist Church of Benkelman, 803 Chief Street, Benkelman, NE 69021, Dundy County Hospital, 1313 N Cheyenne, Benkelman, NE 69021 or to the Donor’s Choice, POB 476, McCook, NE 69001. Gene’s family would like to thank everyone for their love and concern. Gene was a blessing to many.